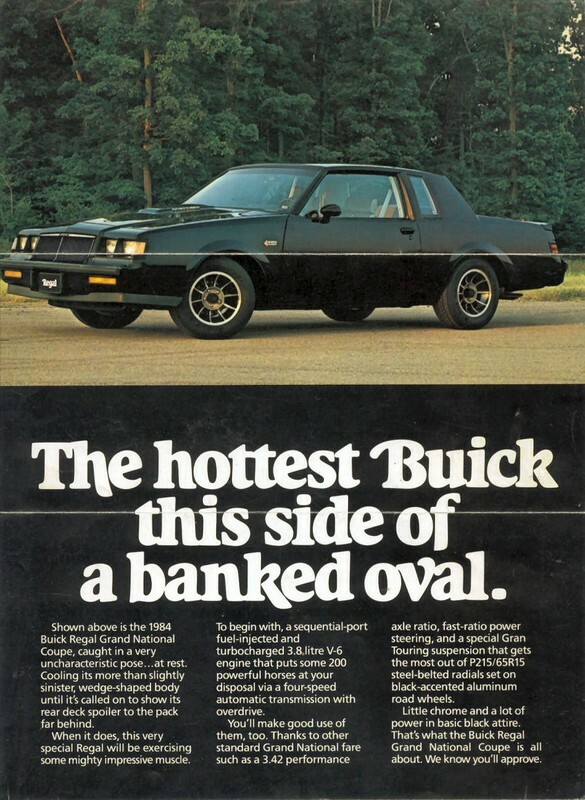 Buick offered five separate T TYPE models (their spelling) in 1983. One of the new ones was the Skylark coupe, Buick’s version of the X-car. The Skylark T TYPE‘s standard powertrain was the LH7 “high output” 135 bhp 2.8 liter/173 ci V6 with a Rochester E2SE two-barrel carburetor paired with a four-speed manual. The 0-60 time was a little over 9 seconds—respectable but not great in 1983. Mileage was 21 city/34 highway by the standards of the day (17/23 by today’s standards). With a 15.1-gallon fuel tank, a T TYPE owner could expect a range of 270 to 375 miles with a 10% fuel reserve. 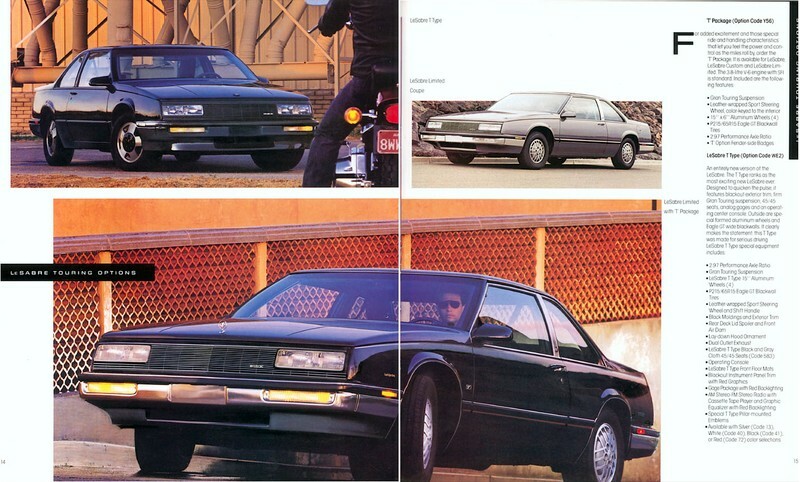 Standard mechanical equipment on the $9,337 T TYPE coupe (about $24,000 in today’s dollars or about what a base 2018 Regal Sportback costs) included a Sport suspension (stiffer rate springs, stiffer shock absorbers, a more rigid front stabilizer bar, and added rear stabilizer bar), a “special tuned” exhaust, a 3.65:1 final drive ratio, and P215/60R14 steel belted radial tires (a size still available from BFGoodrich and Riken) on 14-inch styled aluminum wheels. Exterior equipment specific to the T TYPE included a blacked out grille, smoked tail lamp lenses, and charcoal lower body accent paint. Inside, vinyl or cloth bucket seats with backrest recliner, full-length operating console, special sport steering wheel, and color-coordinated seat belt buckles were included. Standard equipment on all Skylarks included front wheel drive, power rack and pinion steering, power front disc/rear drum brakes, tungsten-halogen high/low beam headlamps, a Delco Freedom II Plus battery, and an AM radio with two front speakers and a fixed-mast radio antenna. Options included dual electric remote mirrors ($78), Vista-Vent flip-open removable glass sunroof ($295), air conditioning ($725), Cruise Master speed control with resume ($170), power windows ($180), tilt steering ($105), and an ETR AM/FM stereo radio with cassette player and graphic equalizer ($505). Skylark pages from the 1983 Buick T TYPEs brochure, linked from the Old Car Manual Project’s amazing brochures pages. 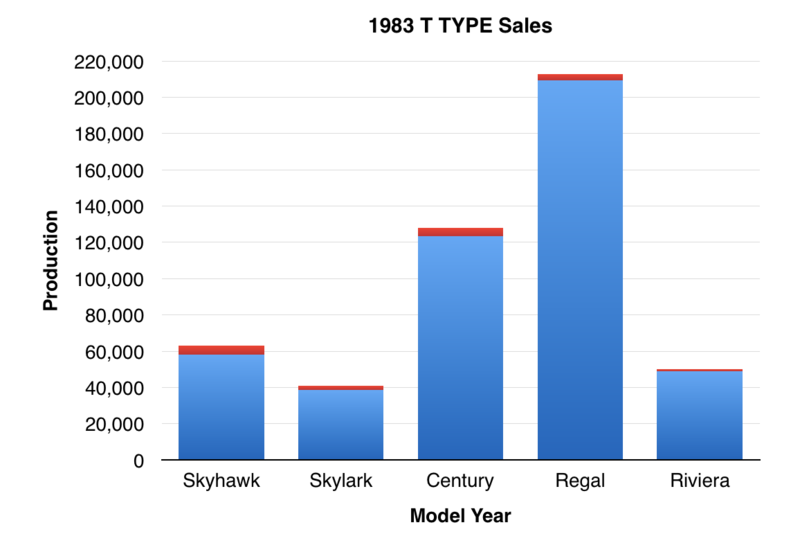 Despite Buick’s commitment to extending the T TYPE line (they even went to the trouble of creating a T TYPE brochure), sales were not impressive—about 3.5% of the sales of the Skyhawk, Skylark, Century, Regal, and Riviera. Of the T TYPEs, the Skylark was comparatively successful, with 2,489 sold—about 6.1% of overall Skylark sales. I haven’t seen a Skylark T TYPE since they were new and I saw one parked outside of the long-gone Crown Buick on the Lincoln Highway in Ardmore, PA. Skylarks of this era are rarely seen in the Hemming’s Motor News classifieds and on eBay Motors—when one does come up for sale Hemmings considers it worthy of a portion of a blog entry. 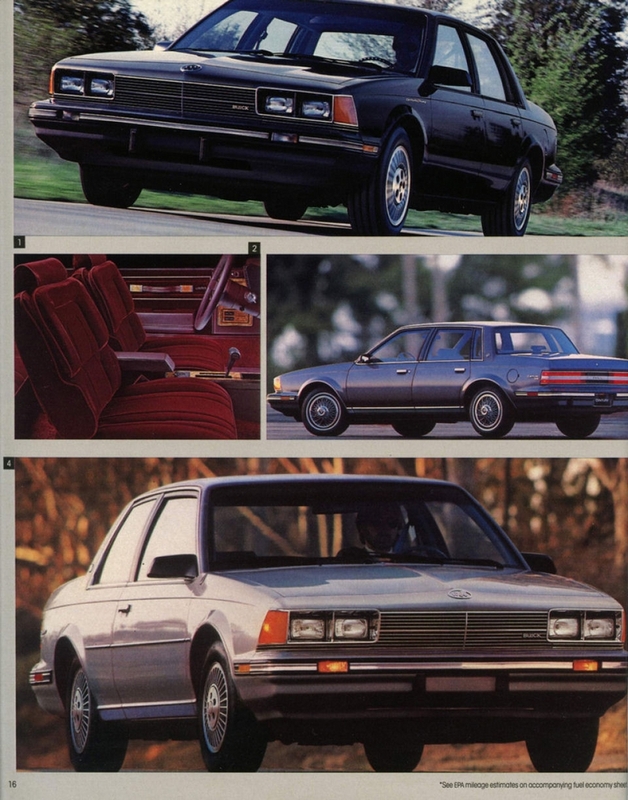 There were only four exterior colors available for the Skylark T TYPE: White, Silver, Dark Red, and Light Sand Gray. Make mine Silver, please. This entry was one of my first posts on this blog. I’ve updated it to reflect both changes in my posting style and substantial improvements in available data. For 1984, the T TYPE (their spelling) version of Buick’s Riviera gained sequential fuel injection, yielding a respectable 190 bhp from the evergreen LD5 3.8 liter/231 ci turbo V6. Performance figures for the later Riviera T TYPEs are hard to come by, but I’m betting that 0-60 mph came in between 9 and 10 seconds. Fuel mileage for the big coupe was decent by the standards of the day: 14 city/21 highway (13/20 by today’s standards). With the 21.2-gallon fuel tank, range was about 310 to 335 miles with a 10% fuel reserve. A T TYPE continued to be the only way to get your Riviera coupe turbocharged—you could get a “civilian” Riviera convertible with the turbocharger. The $17,050 T TYPE (about $42,500 in 2018 dollars or about what a well-equipped 2019 Buick Regal GS goes for) came with a blacked-out grill, amber parking light and turn signal lenses, black mirrors, and P205/75R15 tires (a size still readily available) on 15-inch styled aluminum wheels. Additional instrumentation for the T TYPE included a turbo boost gauge and an LED tachometer. The 1984 T TYPE also included the Gran Touring Package which featured stiffer springs, re-calibrated shock absorbers, and larger diameter anti-sway bars front and rear. Standard exterior and mechanical features on all 1984 Rivieras included a four-speed automatic transmission, power steering, power brakes, and power antenna. Inside, every Riviera had air conditioning, power door locks, and power windows. An extensive list of options included electronic climate control ($150), rear window defogger ($140), and Twilight Sentinel ($60). Options available for every Riviera except the convertible included the Delco/Bose Music System ($895) and the Astroroof ($1,195). Sales weren’t great—with only 1,153 made, T TYPEs accounted for only about 2% of the robust overall Riviera sales. T TYPE sales would continue to dip in the last year for the “big” sixth generation Riviera—there were only 1,069 made in 1985. 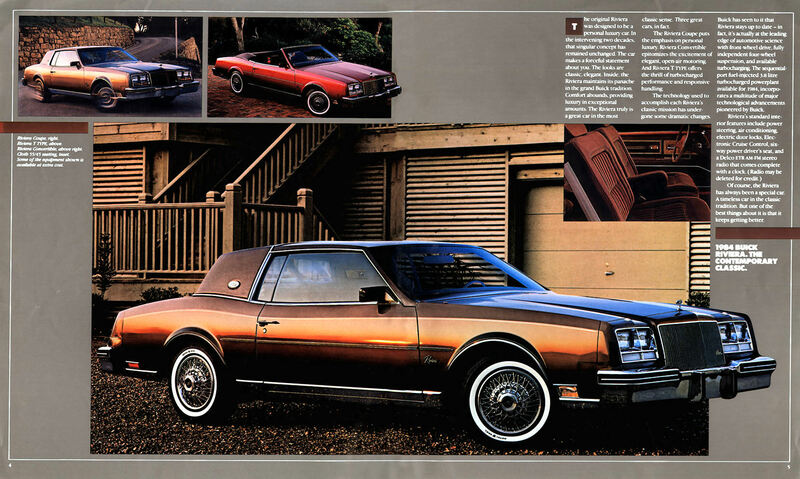 My theory is that there weren’t a ton of folks searching for a big (206 inches long and 3,660 pounds) performance-oriented (but not really high performance) coupe in the mid-1980s and there was competition from vehicles like the brand new Lincoln Mark VII LSC. Riviera page from 1984 Buick brochure, linked from the Old Car Manual Project’s amazing brochures section. Unlike many other cars from the 1980s, folks are saving the sixth generation Rivieras. For example, there’s robust discussion and support on the AACA’s Buick Riviera page. T TYPEs also come up for sale every once in a while in the Hemming’s Motor News classifieds or on eBay Motors—as I update this blog entry in December 2018, there was a gray 1985 with 62,000 miles available on eBay Motors for $7,000. According to Hagerty’s valuation tools, all the money for a 1984 Riviera T TYPE in #1/Concours condition is $15,500, with a far more normal #3/Good condition going for $5,400. Make mine the extra-cost ($210) Medium Sand Gray Firemist, please. I love those Buick color names and believe everyone should have at least one Firemist.